It is human nature to try new things, to learn more. As Pesach is approaching, how can we ensure yet another Seder that is fresh and exciting? How can we find new insights? How can we make this night special? How can we ourselves connect and how can we inspire our children? This year, I want to introduce you to the Hagadah called ‘The Night that Unites’. A Hagadah that comprises of the life lessons and stories of Rabbis Kook, Soloveitchik and Carlebach compiled by Rabbi Aaron Goldscheider. While it is a Hagadah, I started to read the commentaries this Shabbat and could not put the book – sorry I mean the Hagadah down. What a great read. First of all, it is clear that all three Rabbis shared a great love for the land of Israel. Equally important, they each saw the beauty and potential in every single Jew. They taught a Torah of Kindness, and it is in this spirit that the Hagadah is presented. I will share a few thoughts from the Hagadah. The central Mitzvah of the Seder is to tell the story of leaving Egypt. How does the order of events proceed in the Hagadah? There is an opinion in the Mishna that the Seder should start with ‘Mah Nishtanah’, but it starts with ‘Kiddush’. Reb Shlomo Carlebach shares an insight from the Alexander Rebbe: A Jew should not ask questions first – but connect to something deeper than ‘questions’. We need to be connected to faith in order to begin and this is why we start with ‘Kiddush’. This itself introduces some questions: Do you agree with this premise? Do you feel that it is important to have a secure grounding of faith before questioning? Or, do you think that faith comes through questioning? I will be asking my children these questions come Seder Night. Another idea concerning ‘Ha Lahma Anya’ – ‘The bread of our affliction’ is written in Aramaic and not in Hebrew. It appears that this paragraph was inserted after the destruction of the Temple, and the Jews were living in Babylon. The idea is suggested that it must have been very difficult for Jews to sit down at the Seder Table and celebrate freedom and redemption while in exile. After all, they were still ‘slaves’ in a foreign land. Rav Kook says that this paragraph is one of hope. Just as we were redeemed in Egypt, it can and surely happen again. I could go on and on with more insights from this Hagadah…. I recommend you nourish your soul with ‘The Night that Unites’ and its concentration of inspirational ideas. This Hagadah is available in English and Hebrew at Steimatsky Books and other fine Book Shops . 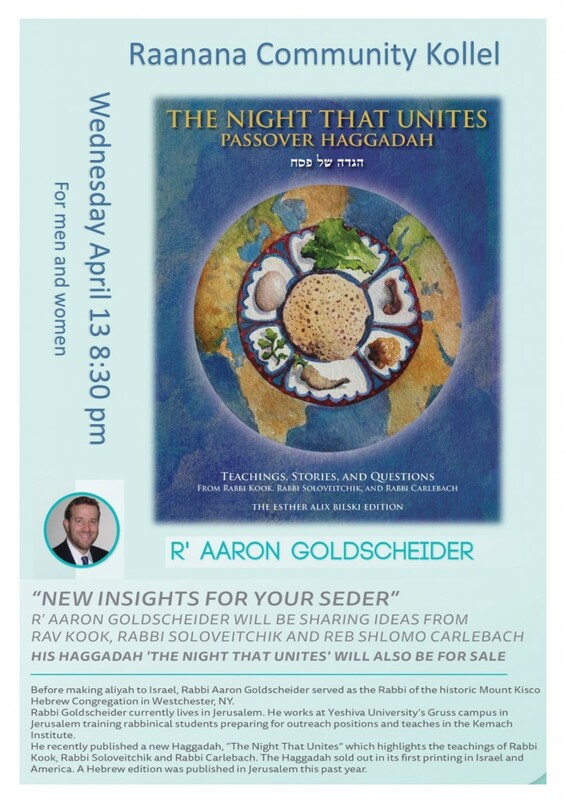 Rabbi Goldscheider will be speaking and sharing more of his insights this Wednesday, 13th April at 8.30 pm at 198 Achuza, Raanana.